It's Star Wars mania! Today is "Force Friday" and Lucasfilm has announced/launched toys and goodies and tons of new items for the fans to go crazy over. Found amidst all the buzz and reveals are three new promo banners for Star Wars: The Force Awakens – full-size "quads" (like from the UK), rather than actual posters. 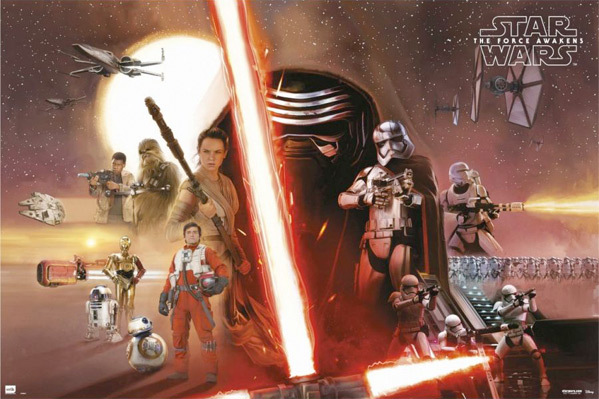 Which makes me believe these may just be promo banners or purchasable posters more than official art (plus, there has to be more coming from Drew Struzan). That said, it's very cool to see more imagery. The First Order stormtroopers, a sleek shot of Kylo Ren, and a nice combination of everything in the movie. Here's the new promo banner for J.J. Abrams' Star Wars: The Force Awakens. How excited are you? 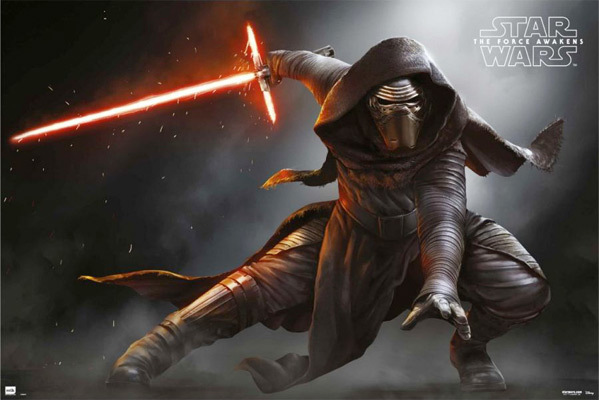 You can still catch the second, full teaser trailer for Star Wars: The Force Awakens here. More soon. If nothing else, this film series will inspire a new generation of dreamers, explorers and wanderers. I strongly disliked the prequels. Their quality was about a 5/10. But their scale, scope and setting could have still inspired young minds. Let's not forget that for a few generations now, EPISODES I; II; III, were their STAR WARS. A little disappointed with the Photoshop work in that 3rd one. You can see that some of those troopers are the same one copy and pasted (front from left, 2 and 5 for example) and the reflections in the floor - you would never be able to see the top of their boots. I know its picky and I am really am looking forward to the new addition to the iconic series but when this jumps out to me without even looking for it, and with a franchise as big as this, you would expect or at least hope for perfection, and that 3rd one is hopefully not a sign of things to come. May the force be with you. Regardless of the program used, the artist took the trooper and copy/flipped him for the reflection. You can see this where the heel meets the floor - front row, 3 in from left, left foot for example. His foot is flat on the floor and yet there is a good amount of space between that foot and the reflection - its not correct any way that you look at it. This is from copy/paste. And for the reflection... we would not be able to see something facing upwards reflected in the floor from the this angle, looking down. Case in point (and I know she is not facing the same direction as the trooper but our angle of viewing is about the same), http://ownposters.com/images/gq7e04gby5216whp.jpg. Some people may understand what I mean and you probably will not. Either way, it really does not matter. I am sure we all can agree that we are looking forward to this next film and hope that is does not turn out to be disappointing. He knows all about reflections. It's when the sound of the person bounces around things and it vibrates. 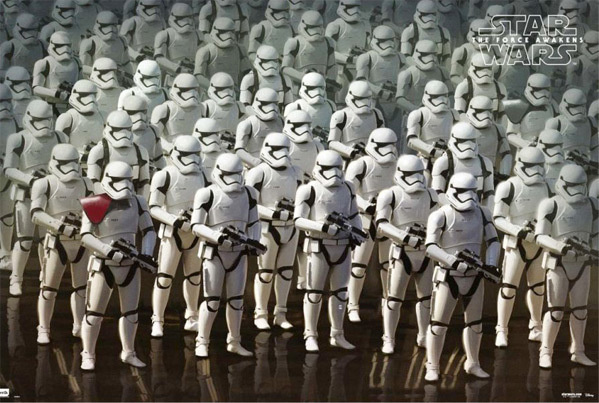 There's bo way the stormtroopers could create sounds with their state of the art armor. clearly this photo is a fake. it looks like crayons or something. You don't understand the graduation of shadows obviously. It's an obvious copy and paste. Let's go over a few things. 1) what does auto desk have to do with anything, it's merely the tool used by the artist. 2) it saves time to do this and tweak the shadows by the artist. They probably have a budget as most people do. 3) how does the boots angling upward explain physics exactly? Just curios as to how you came to this conclusion. You're talking to someone who actually studies and works in physics and forensics. Just want you to state your case since you claim to know what you're talking about. You at the bar so why not demonstrate your intellect to all these people on your level of understanding...or just go back to being a keyboard jockey. Go ahead and explain all about reflections and light source. I'll correct you when it's needed. i read some more about phisics last night...I decided to test it out and I dropped my mom's cat and a feather outside my window...poor Mr. Jinx. Died in the name of science. But now I am an expert on gravity. It's like a big magnet that pulls us all down. So people must have like little magnets in their feet or something. The stormtroopers have magnets too but who ever created that pick got the magnets wrong or maybe they are just different in a galaxy far, far away. I like physics...and I like turtles. Dad said I can go to work with him tomorrow. I can't wait to tell all the grown ups about physics. I so smart. Teacher said I can be anything when I growed up. Start with the law of reflection. Once when you google it you'll understand why this is a copy and paste. there's glue all over this...clearly the guy used scissors to cut the stormtrooper from an old newspaper...and the used paste to get it to stick to my monitor. So Photoshop isn't an industry tool? look man...I study physics. I know all about apples falling. this photo is fake. I agree. I hate seeing sloppy work like this on a poster for a movie with a production budget of over $200m and an obviously huge marketing budget. Instead of doing it right, this image that will be seen all over the world was done quickly. Only maybe 3 or 4 slightly different stormtroopers are used, copy and pasted a bunch, which makes some sense because the idea is that they're a faceless, uniform army. Though, with that few variations used, I would probably just say ditch the photo realism and make them all exactly the same and a graphic, like a war propaganda poster. That's more taste, though. I don't consider it as much a case of "do not do this!" as, say, the repeating background on the Batman v Superman title card. Anyway, the issue that seems to be at hand is the reflections and, very clearly, the reflections are just the stormtrooper layer copied and flipped, then aligned to the bottom of the "physical" layer. it's painfully obvious when the physical toes and reflection toes touch, but the heels are at the opposite angle as above and not touching. demonstrating real quickly, cut out the portion of the trooper needed, flipped it - keep the boots at 100% size and ratio, which would also be a rare occurrence in natural floor reflections - then lower the opacity. boom. simple, lazy reflection that anybody who's ever seen a reflective surface should be able to call out as not being real, or even convincingly well done. Well said. Seems they could've spent more money on the marketing end of things or splurged a bit more on the QA department. does anyone know when we will get a full feature trailer? so far it has just been teasers..
eh a saw a few news sites, most notably IBT say that there will be one this week. but who knows, could be october for all we know. that seems rather late, maybe that's when they're gonna do one of those featurettes/interview/here's sneak peek things? Its now Sept.. were like 3 months away from a new Star Wars.. I'm just super excited.. want to see more and more content ... but wait we must young Padwan, for the answers we seek are right in front of us.. haha -- Clone Wars ..
Yeah part of the experience is knowing little to nothing about the story, but I think there going to set up a huge story arc for the new continued canon. It's going to anger a lot of fans, but make the ones who aren't, very happy.